/ Home / Press office / PR opinion / Sugar and diet – a taxing problem? Sugar is the new villain of the Western diet - but is taxation the answer? At the end of June it was announced that the UK Government may halve the recommended level of added sugar we should eat each day. At about the same time the World Health Organization recommended that we should limit sugar intake to just five per cent of our daily calorie intake. These new recommendations were not introduced out of the blue: they came about as the result of an influential and comprehensive draft report by the Scientific Advisory Committee on Nutrition (SACN). The report focuses on carbohydrates and health (sugar is a carbohydrate), and presents clear evidence that an increasing consumption of sugar leads to tooth decay, being overweight and obesity. Being overweight or obese increases the risk of diseases such as cardiovascular disease, Type 2 diabetes, and colorectal cancer . The report and subsequent Government and WHO actions are the latest in a long line of findings and recommendations that throw the spotlight on sugar as an insidious and damaging component of the western diet. In January of this year academics warned that sugar had become “as dangerous as alcohol and tobacco” in relation to impact on human health, and in March Dame Sally Davies, the Chief Medical Officer, stated that in order to curb obesity in this country we may need to consider a tax on sugar. Last month sugar consumption was directly linked to a rise in dental disease in children. One result of the SACN draft report is a document from Public Health England (PHE) entitled “Sugar reduction: Responding to the challenge”. 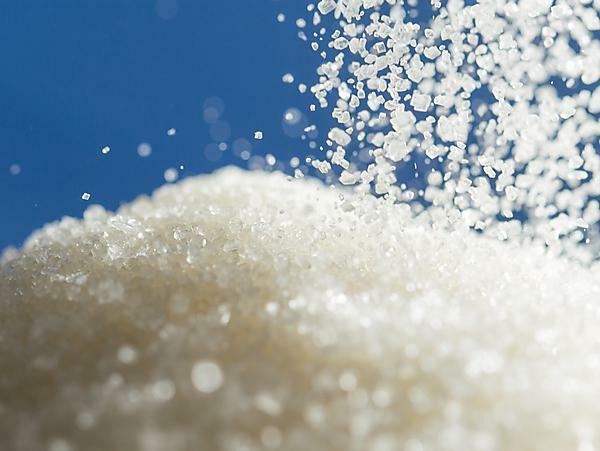 The document is the result of a request from the Department of Health asking PHE to respond to the SACN report and provide evidence and advice that the Government can use to develop a strategy for reducing sugar consumption. We can expect some early action from this, with the planned launch of a digital marketing package to help families and individuals reduce the amount of sugar they consumer. This will be followed in January 2015 by a focused Change4life campaign to change the sugar consuming behaviour of the nation. According to some figures, the average Briton consumes an astounding 238 teaspoons of sugar a week – that’s more than one kilo. But if you asked the majority of the population how much sugar they ate the amount would be much lower: this is because so much of our western, processed diet contains hidden levels of the stuff. And it’s not just in the obvious culprits, such as fizzy drinks and confectionery. Sugar is lurking in any number of seemingly innocuous everyday foodstuffs, such as canned tomatoes, salad dressings, peanut butter, breakfast cereals, bread, pasta – the list goes on. Recent recommendations even place alerts on smoothies and juices which, previously, had been accepted as legitimate contributors to a healthy ‘five a day’. This is due to the release of natural sugars during the juicing process which damage teeth and, because they are so highly concentrated, contribute to our high calorie intakes. Other plans outlined by PHE include reworking the five a day message to take into account new thinking on smoothies and juices; working with all partners to revise nutrition messaging on food packaging so that it reflects the SACN’s advice on carbohydrates and health; supporting the Department of Health in its work with the food and drink industry, and; more discussion around issues such as the advertising of food to children, the role of the food industry, food procurement across the public sector, education and training, and taxes on sugar-sweetened drinks. The charity Sustain, which advises the Government on food and farming issues, says that people in the UK consume more than 5,727 million litres of sugary soft drinks a year, and that adding a 20p tax to every litre sold would raise more than £1.1 billion – which could be used to improve many aspects of the health of the nation. Unsurprisingly, the suggestion that sugar should be taxed has not been welcomed in all quarters. The Food and Drink Federation argues that such a tax would “hit the poorest families at a time when they can least afford it”, while others question whether those who maintain a healthy diet and lifestyle should be taxed to mitigate the lifestyles of those who don’t. My argument is a simple one: whether we are directly or indirectly affected by obesity, at the end of the day it is everyone’s problem and we should all be worried about it. Obesity places an enormous burden on the NHS and other social services. Take diabetes as an example. Not all incidences of diabetes are caused by obesity or an unhealthy lifestyle, but the vast majority are. According to the Impact Diabetes report, the cost of treating diabetes will rise from £9.8 billion to £16.9 billion in 25 years’ time – which will equate to 17 per cent of the total NHS budget. Treatment for cardiovascular disease, another condition exacerbated by obesity, costs the UK health system around £9 billion. The cost implications of obesity are not just confined to health care expenditure – there are ramifications for the wider economy too. In 2013, the Office for National Statistics estimated that 131 million days were lost to UK businesses through absences due to sickness and many of those illnesses can be linked to obesity. According to the CBI, absence from work through sickness is costing the UK £14 billion a year. But the argument for a tax on sugar to help curb obesity is about more than money saving: it is about improving the health of the nation in general. The SACN report is clear on the relationship between sugar consumption and obesity, and tooth decay . As highlighted in research by colleagues as part of this feature, there is now a clear link between childhood obesity and the lowering age of puberty. We are, on average, living for longer. As a consequence, our bodies and our good health need to last us for many years more than in previous generations. Good diet, exercise and a healthy lifestyle adopted from an early age holds us in good stead for healthier, more active later years. Not only does this mean a pleasanter later life experience for us as individuals, it also means that as we age we become less of a potential burden on those around us and the services designed to support us. If the UK was to introduce a tax on sugar it would not be the first country in the world to do so – other nations, such as France, Finland and Hungary have already placed taxation on sweetened beverages. Obesity in the UK is at a very high level and if it continues to increase at its current rate the outlook for the health of the nation is, without exaggerating the threat, scary. The very fact that the Chief Medical Officer has suggested a tax on sugar and that PHE will be considering a tax on sugar-sweetened drinks, are indicative of how seriously the issue is taken by those at the very highest levels. We need to look at lots of different approaches to the problem: a tax on sugar is just one of those approaches and, in my view, a sensible one to adopt.